Most, if not all design and publishing programs allow you to choose not only the typeface and styles, but also the specific color of your text in your document. When choosing a text color, you can change the color properties based on RGB values, CMYK values, or by choosing specific Pantone colors.. This feature is great for creating rich and vibrant colors to use for your text and headings, but there are certain considerations when creating black body text with a small font size. 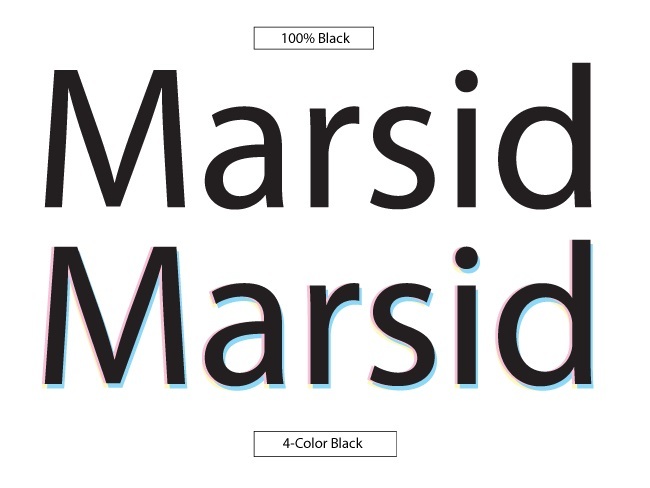 Black body text should print black only (CMYK 0, 0, 0, 100) which is also called pure black. Because CMYK prints use four color plates, text that contains other colors besides 100% black will also print the other colors along with black. If the color plates are not perfectly aligned (registered), this could result in blurry text. The smaller the font size, the more likely this is to cause issues. The image below shows how CMYK text can appear if not perfectly registered. The same issue can occur for small white text reversed out of four colours.